From the end of Reconstruction until the Great War, Washington was the center of the black aristocracy. Nowhere else in the United States possessed such a concentration of “old families,” not merely from the District and nearby Maryland and Virginia, but from throughout the country, whose emphasis on family background, good breeding, occupation, respectability, and color bound them into an exclusive, elite group. Upper-class blacks from Philadelphia, Boston, New Orleans and other places gravitated to Washington D.C. in sizable numbers due to its educational and cultural opportunities, the availability of jobs on par with their education, and the presence of a black social group that shared their values, tastes and self-perceptions. The “black 400” of Washington consisted of fewer than a hundred families out of a black population of 75,000 in 1900, and centered around the family of Blanche K. Bruce , an ex-slave and former Mississippi Senator who served in Congress from 1875 to 1881. 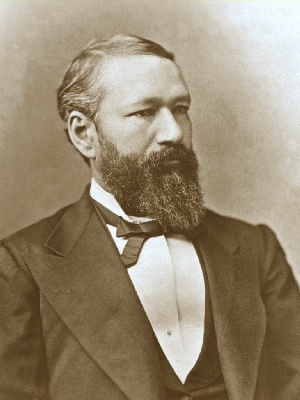 Bruce who was also the first Black American to serve a full term in the U.S. Senate. Born in Virginia to a black woman and a white man, who may have been their master, Bruce was fortunate in that his master took an interest in Bruce, thereby he was permitting Bruce to share lessons with the master’s son. In later years, Bruce shared that his life as a slave in Virginia, and later in Mississippi and Missouri, was in fact no different from that of his white peers. In 1850, Bruce moved to Missouri after becoming a printer’s apprentice and from there he escaped to Kansas and declared his freedom. After the Union Army rejected his application to fight in the Civil War, Bruce taught school and attended Oberlin College in Ohio for two years and from there, he went to work as a steamboat porter on the Mississippi River. In 1864, he moved to Hannibal, Missouri, where he established a school for blacks. During Reconstruction, Bruce became a wealthy landowner in the Mississippi Delta. He was appointed to the positions of Tallahatchie County registrar of voters and tax assessor before winning an election for sheriff in Bolivar County. He later was elected to other county positions, including tax collector and supervisor of education, while he also edited a local newspaper. He rose rapidly in Republican Party ranks and was elected to the U.S. Senate in 1874. Bruce’s arrival in Washington aroused much comment: he was relatively young, cultured and handsome. Even those who resented his presence in Congress could not find fault with his innate dignity, elegant manners and shrewd political judgment. 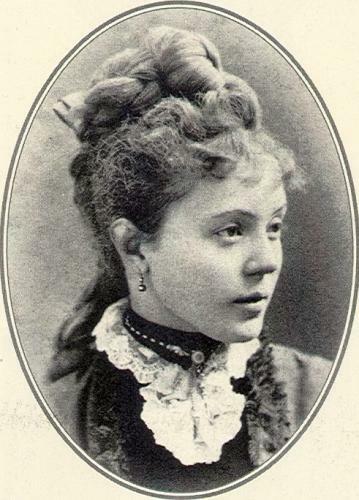 When he married Josephine Beall Willson of Philadelphia in 1878, they set Washington society–both black and white–ablaze, most noticeably because Josephine Bruce was very light-skinned, wealthy, very highly educated and beautiful. During Bruce’s residence in the District, he and Josephine entertained lavishly, taking as full a part in official Washington society as possible. 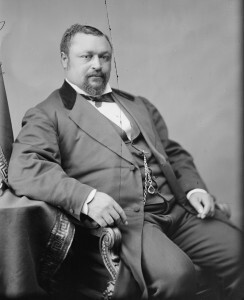 The Bruces, along with other prominent black Washingtonians such as Hiram Rhodes Revels, P.B.S. Pinchback, Josiah Settle, Robert Harlan, Norris Wright Cuney, etc, directly challenged notions about black Americans during that period. , John R. Lynch ($80,000), Charles B. Purvis ($75,000), Daniel Murray ($60,000), J.H. Meriwether ($60,000), George F.T. Cook ($50,000), Furman J. Shadd ($40,000), and John R. Francis ($35,000). Despite the hardening of racial practices and the erosion of civil rights for blacks in post-Reconstruction America, the black elite held steadfast hope that blacks would achieve equality. However, this black “400” was insulated against the hardships of Jim Crow, and many were accepted by white Washington society–several black families were listed in the 1888 issue of Elite List, a forerunner of the Social Register, a few attended white churches, and even after certain public places closed their door to blacks, they sometimes made exceptions in the case of “refined and genteel Negroes.” Because of their successes, the notion that Washington was “the colored man’s paradise” gained wide acceptance among blacks and whites anxious about the turning tide against integration and rehabilitation of the nation as Reconstruction began to die. Though the “colored aristocracy” was hampered with issues of color, refinement and social status, they did nonetheless see themselves as a “buffer” between whites and lower-class blacks; a buffer that would prove the equality and ability of black Americans in a post-Civil War society. The history of Greek letter societies in America begins on December 5, 1776, with the founding of The Phi Beta Kappa Society at the College of William and Mary. Its name deriving from the initials of a secret Greek motto, Philosophia Biou Kybernētēs = “Love of learning [is] the guide of life”, the fraternity was a forum for students to discuss topics not covered by their classical education. In addition to its secrecy and selection of a Greek name, it also introduced a code of high ideals, secret rituals and handclasps, membership badges, and oaths that characterized later Greek letter societies. As Phi Beta Kappa developed, it came to become a very influential association of faculty and select students across several colleges, with membership becoming more of an honor and less of a functioning society. This uniquely North American institution soon flourished and soon, new or auxiliary chapters of existing fraternities were present on nearly all college and university campuses across America. At the same time, sororities (initially called fraternities until the word was used to define Gamma Phi Beta at Syracuse University in 1874) grew from the popular Greek movement, with Kappa Alpha Theta of DuPauw and Kappa Kappa Gamma (both 1870) formally recognized as being the first secret society for collegiate women based on the Greek secret societies for men. Taking note of this, America’s black educated elite followed suit, and Alpha Phi Alpha became the first intercollegiate Greek letter fraternity established for people of African descent when it chartered a chapter in 1906 at Cornell University. In Spring 1907, Ethel Hedgeman led the efforts to create a sisterhood at Howard University, inspired by the Greek experience of future-husband George Lyle, who was a charter member of Alpha Phi Alpha Fraternity’s Beta chapter at Howard. Hedgeman recruited any interested ladies and by autumn of that year, Hedgeman and eight other women began to draw plans for the organization. 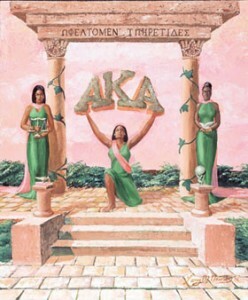 With Hedgeman serving as the temporary chairperson, the women wrote the sorority’s constitution, devised the motto and colors, and named the sorority Alpha Kappa Alpha. In early 1908, seven sophomore honor students expressed interest and were accepted without initiation; however, the first initiation was held in a wing of Miner Hall on Howard University on February 11, 1909. Alpha Kappa Alpha grew at leaps and bounds at Howard, and featured a bevy of ritual and sponsored social events. The sorority did hit its first snag, however, in 1912, when twenty-two members were initiated and seven officers were elected. The twenty-two were dismayed at progress and wanted to reorganize the sorority, leading to a split into two factions. The new members wanted to establish a national organization, enlarge the scope of activities of the sorority, change its name and symbols, and be more politically oriented. When Nellie Quander, a graduate member, heard about changing the sorority name, she disagreed and gave the other women a deadline to stop the efforts to reorganize the sorority. However, the twenty-two declined and instead formed Delta Sigma Theta on January 13, 1913. 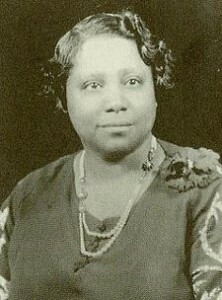 Quander later revised her opinion, and along with five other sorority members, led an initiative to incorporate Alpha Kappa Alpha Sorority as a perpetual body on January 29, 1913.The organization was nationally incorporated in Washington, D.C., as a non-profit under the name Alpha Kappa Alpha Sorority, Incorporated on January 30, 1913. During the same year the sorority began using Greek names for officers. After this, AKA continued to spread its wings with a second chapter at the University of Chicago in was chartered in fall 1913, with many others following soon after. In a time when women were marginalized, and women of color were even more so, the ladies of AKA possessed a bravery and courage in their active role in the voting concerns of the day and the support for black rights and education. In addition, Alpha Kappa Alpha helped to support members by providing scholarship funds for school and foreign studies. 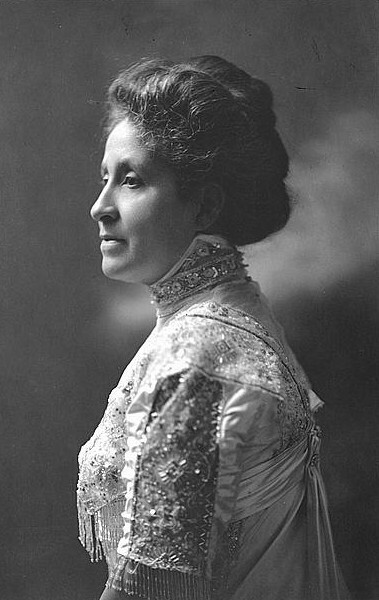 After graduating from Howard, Ethel Hedgeman Lyle and the other founding members of AKA continued to be a guiding light to subsequent pledges and members, using their education and social standing to uplift and encourage the lives of black Americans, and uphold the sisterhood, amidst crushing racism and violence practiced against blacks. Today, the sorority boasts a membership of college-trained women around the world, with active members who comprise a diverse constituency, from educators to heads of state, politicians, lawyers, medical professionals, media personalities, and corporate managers, and many chapters, located in the United States, the Caribbean, Canada, Germany, Korea and Japan.